Scotsman has added more models to its EcoX range, with new, greener versions of its EC icemakers joining the previously released variants of its market-leading ice machines. The EcoX range uses only natural refrigerants and is fully compliant with current and forthcoming F-gas regulations. This gives them an Ozone Depletion Potential of zero and a Global Warming Potential of three or less. The Scotsman EC range are self-contained icemakers with a built in wastewater pump. 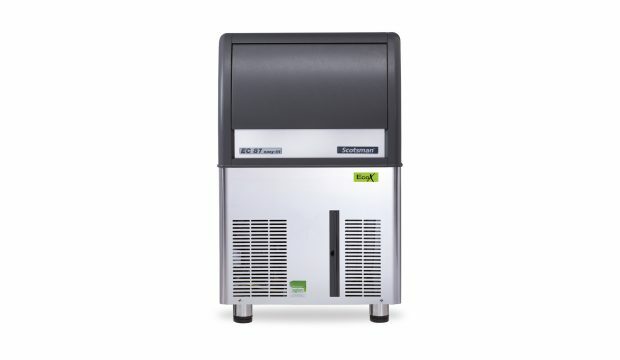 Their addition to the EcoX range means they are the only ice machines with this technology using eco-friendly refrigerants on the market. The pump gives greater flexibility in installation, allowing a wider range of locations to take advantage of a supply of crystal-clear ice cubes. That’s because traditional ice machines have to be installed above the drains, to allow waste water to flow away. The EC’s pump means they can be sited further away from the drain, or even below the drain height, making it ideal for use, for example, in basement bars. EC machines make gourmet Supercube ice, and are available in a range of production capacities from 25kg up to 170kg ice cubes a day. They can also be specified to produce three different cube sizes. Gourmet Supercubes are ideal ice cubes for drinks’ presentation. They are crystal clear, with an attractive, slow melting thimble shape which makes them the perfect accompaniment for on-the-rocks drinks, where looks, lack of dilution and effective chilling are vital. Scotsman remains committed to creating a range of eco-friendly ice makers suitable for a range of different uses. The addition of EC models to the EcoX range brings the collection to over 30 models. More information can be found on the Scotsman website.